During our negotiations to recover the GLD held in the Cryptsy receivership, I was presented with a very unique opportunity. On one particular conference call, I was informed by the attorneys that in addition to the Goldcoin, their forensic team had uncovered hard drives containing more than 175 other various cryptocurrencies. And further, that they had determined that the analysis and inventory of these wallets would be cost prohibitive. To prevent these coins from just wasting away, we decided to buy them. 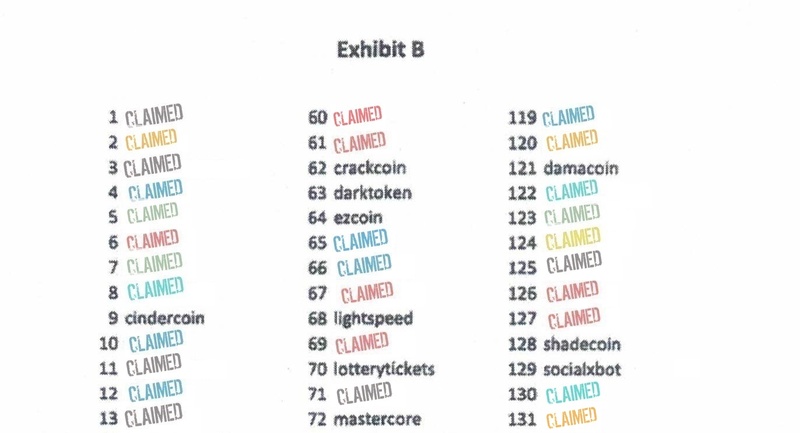 We tried to get all of the cryptsy coins but lost our bid to secure UNO and the coins listed in exhibit A. My first thought was to sell some of these coins, but we decided today that the right thing to do is to give them back w/ no strings attached. So in this thread, I will be doing precisely just that.. If you are a developer and/or long-standing community member interested in one of these coins, please reply below. 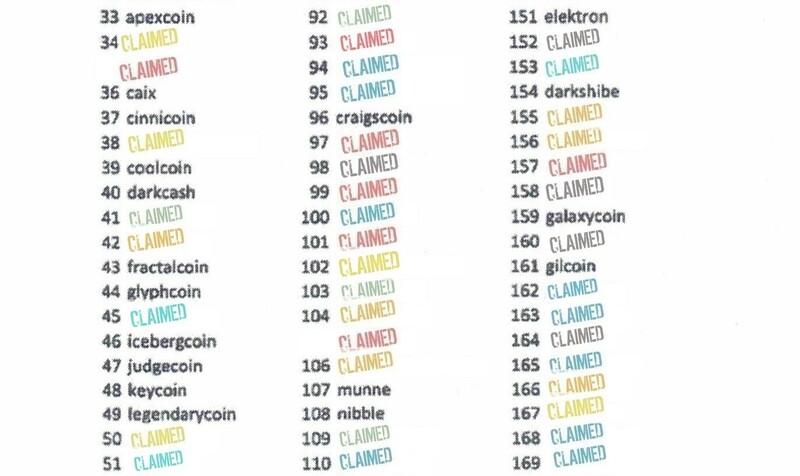 The coins redacted from the list are not eligible or are no longer available. All coins will be delivered via a dropbox link to an uninspected unsynced wallet.dat file. Wow MicroGuy! You are doing a fantastic thing in light of this bad situation. I know I lost a bit GoldCoin on Cryptsy, but it did teach me a valuable lesson about not keeping too much on the exchanges. Thank you for the kind words Jack. I'll get the wallet you requested ready today and PM you a password-protected Dropbox link. Pretty damn awesome of ya microguy. If no one has dibs on any of these wallet files i would be most grateful to receive at least ONE of them starting from the top. my wallet is like an onion, I cant open it without crying. I'll pick one from the list and send you a password-protected Dropbox link via PM tomorrow. wow some of them names bring back memories, lol how many pennies in that wallet, i did lose alot of pennies on cryptsy i'd lost count on how many zeros on the end of what i lost lol. but no no interest in claiming any of those pennies back. don't see it on the list was there any bitcoin scrypt? (i'm o the dev team for reviving that as we speak). Hi Kelsey. The only coins we received are those listed above from Exhibit B. I'll get to your PM here shortly. This giveaway is designed for a coin's developer and/or long-standing community members only. Yes its called the "Cryptsy Community Relief Project", one would hope the people claiming wallets are doing so to help the coin communities (if they still exist) of the coins wallets they are claiming. 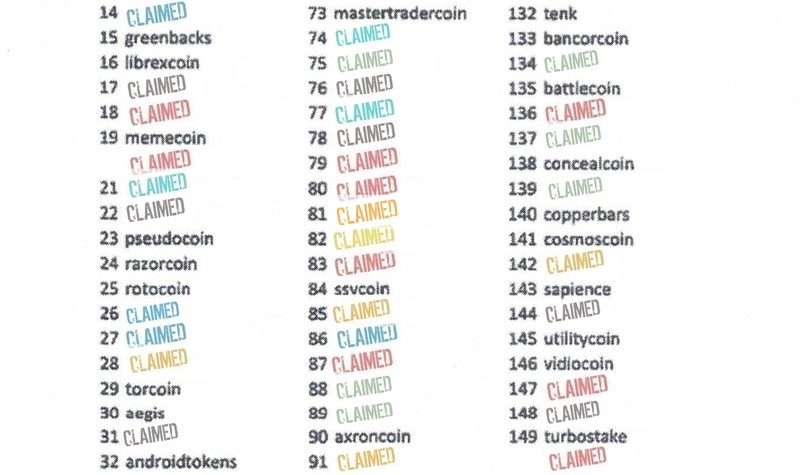 The master list (Exhibit B ) has just been updated to reflect the coins remaining. A good point is made here. Many of the wallets have very little in dollar value. They take a ton of time to process and sync with some wallets up to 4 GB in size. In certain cases, getting the coins out of the wallet is a waste of time. Its like prospecting or mining as you don't know what you will get until later. Of the coins that I have the wallets of, some are nearly dead with no wallets online. No exchanges, or barely any hash power to move coins. a few wallets had something worth mentioning and I will help one of those communities. thanks to you and the goldcoin community for your actions/steps recovery and return the lost coins/wallets of cryptsy desaster. As a EMD supporter and longterm holder/miner i am running currently the www.emeraldcrypto.de the support website for Emerald Crypto. Our dev Spidersbox would take part of this procedure as a second pair of eyes. I used to mine StarCoin and Neocoin in 2013 and later. Since you have the StarCoin wallet, you can send it to my email address if you want to. The devs have long since vanished. Looks like someone else got the Neocoin wallet.